Thank you for your email! I looked into this for you and regretfully, there were unexpected delays in production of the four 10” discs which form the new limited edition collection The Joshua Tree Singles Vinyl Collection: 1987 & 2017. Production is now underway again and dispatch of the gift will begin again in early February. We’ll email you as soon as your copy hits the post so that you know when to expect it. Don’t forget, qualifying Subscribers can download all 8 tracks today from the Account Info page. Hope this information puts you at ease. Enjoy your day! "unexpected delays"....meaning they don't know how many people need them? I got that same excuse when the JT30 box set was delayed as well! u2.com email told me in one email,,,got confused with the singles gift, they are so incompetent. I've always called Fanfire and they've been very helpful each and every time. Is it that they are incompetent or overwhelmed by the presales? LiveNation is not a lot of help. The U2 fan club phone people have always been kind and helpful for me. Perhaps that has changed. Stickers on the package shows Dec 7th as shipping date from the USA and a po box in Belgium to use if delivery fails! Can you look in your account to see when you redeemed yours? Trying to figure out a rough a idea of a date of the first lot of redeemers will be. Thanks. I will be one of the ones getting mine after Feb then. Ally33 it's a lottery I've a mate at work who joined here 3 years after me and who picked the 2017 gift over 6 months after me yet he got his over 2 weeks ago. i ask why this could happen but no one seems able to answer this question,maybe there counting all the money from this new tour. Christ! Need to have a sweepstake as to when i will get it then! With all due respect to very helpful and patient mods....that is really funny, Cazza. Thanks for the laugh. You are v welcome..? The mods are fab and presale arrangements are not to do with them. But sometimes we all need a chortle! after several uk> usa phone calls and nearly 12 emails,i was told to ask Merch dept for a refund. now if prints are in stock, well i would prefre them over a refund. 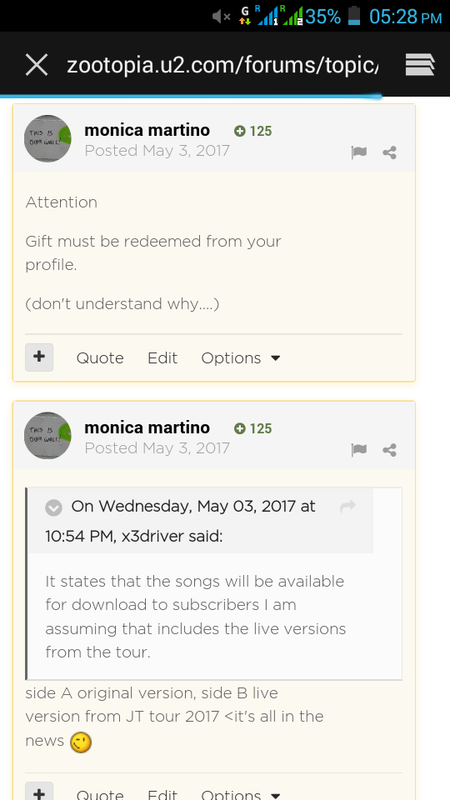 I actually got a reply from u2.com, and i will be getting mine after Feb. So...I was wondering if there was a problem with the quality of the pressings? I bought an *imported* 30 year remastered JT vinyl set here in Australia - $60 - and it had faults. WTSHNN skipped repeatedly and there appeared to be tiny spaces in the grooves. It was a poor quality pressing. I find it bizarre that in my youth I don't remember ever getting a single faulty LP like this so I wonder about the quality control on these new albums. If you bought one and you are keeping it nicely sealed in plastic, you may want to open it and check. I took mine back. $60 for a faulty LP when I own the original anyway...ahem (insert embarrassed cough)...no thanks...but I'm looking forward to these singles arriving in the future! I'd rather they were delayed and top quality...better than being sent out quickly with poor quality control. Still no gift from 2017 will it ever arrive????????? I can download them !!!!! But that is not what was offered as a gift, when will this ever be sorted??? Total farce come on someone get it sorted?? I doubt it...I bought the deluxe JT30th set and I was on LiveNation like a leech trying to find out why I wasn't receiving my item's. I PREordered the option that was the box set + the record bag and it turns out they didn't order enough stock of either and that was the issue. I had the same issue everyone is having now where I continuously got different answers from everyone I spoke to until I finally got someone who said that a new batch was coming in and would send the items to me 2 day express free of charge. The only reason I am bothering to even say all of this is because I had this same exact experience with their "vinyl issues" and I don't want anyone else to have it...let alone to have it myself again. Every vinyl plant has defects that is just quality control I think you just had bad luck on that one. If that is true, i would appreciate them just being honest and could understand why they would want the best quality sent out. Again, if they underestimated the amount that needed pressing, just be bloody honest. The end result will be the same so just be truthful as to why there is a problem. if possible, and you do not want them,i would like them please. 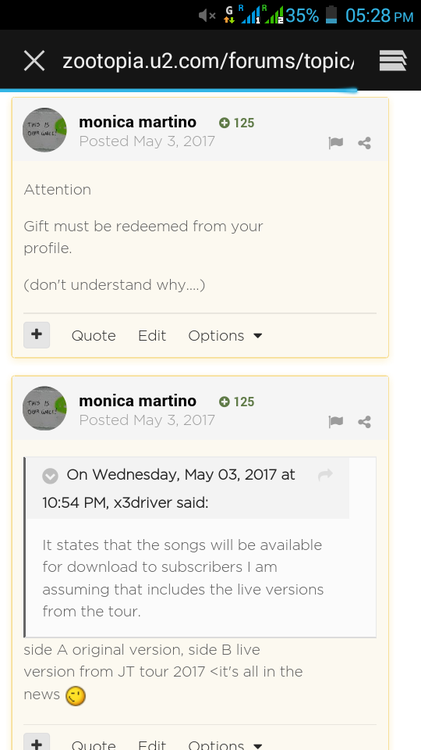 Hi guys, I signed up over a year ago and requested the Joshua Tree vinyl singles as part of the fan club membership, but have never received them. Has everyone else? Is this a known issue? I've written about my order several times but have never gotten a response. It's a real shame because I went ahead and let my fan club membership end earlier this month because they did not deliver on their promise the first time. Why bother signing up again if they don't give you the gift nor reply back to you? Any help would be greatly appreciated. I was really looking forward to that vinyl collection and it's a shame they couldn't even give me a response. Following dispatch of initial orders in December, there were unexpected delays in production of the four 10” discs of The Joshua Tree Singles Vinyl Collection: 1987 & 2017. Production is now underway again and dispatch will resume in early February. We’ll email you as soon as your copy hits the post so that you know when to expect it. Max took you long enough to put any sort of answer up. they are quick enough to take the money but can't supply the item. We (mods) answer queries when we can, as best we can, we aren't in control of how / when / why sub gifts are posted out.